In April 1994, the Morris Bryant restaurant in West Lafayette burned down, fell over, and then sank into the swamp. No, wait. That’s the Swamp Castle in “Monty Python and the Holy Grail”. But the Morris Bryant restaurant did burn and, according to the Journal & Courier, get leveled by a tornado shortly thereafter. At the end of November, the Morris Bryant was reborn as The Bryant Food and Drink Company. The Bryant is spacious and welcoming. It’s an upscale restaurant that feels chic without being snooty. Even in the middle of the lunch hour, we were seated right away. The food menu is a single page, but with a wide variety of offerings to appeal to any palate. The drink menu is similarly varied, and features a lot of what I would call “grown up” cocktails. 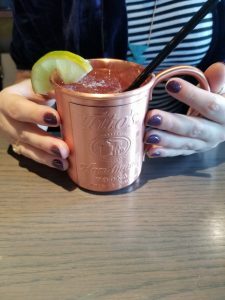 My friend ordered a raspberry mule which was just the right mix of sweet and bitter. 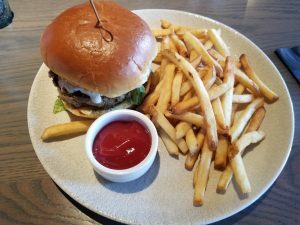 For lunch, my friend ordered the mushroom risotto with a house salad and I got the lamb burger with fries. The house salad was a good portion with gigantic tomatoes — a good inch or so in diameter. 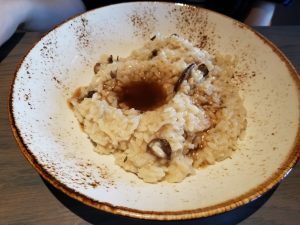 The risotto was hot and creamy, with three different kinds of mushrooms. It also proved to be a good dip for my french fries. The fries themselves were also tasty, but could have been warmer. The lamb burger, which was actually a mix of lamb and beef, was fairly plain. It’s was acceptable, but not particularly noteworthy. For the price and the great service, The Bryant was a great choice. I’ll definitely come back again to try out the rest of the menu. The milkshakes, in particular, look intriguing.